Pamper your skin with Genuine Virgin Aloe TriDerma Relief Cream Fragrance Free 2.2oz, model #73025. TriDerma is a line of true skin care products made with Certified Genuine Virgin Organic Aloe, moisturizers, and other carefully selected botanicals to target and help heal a wide variety of skin problems. 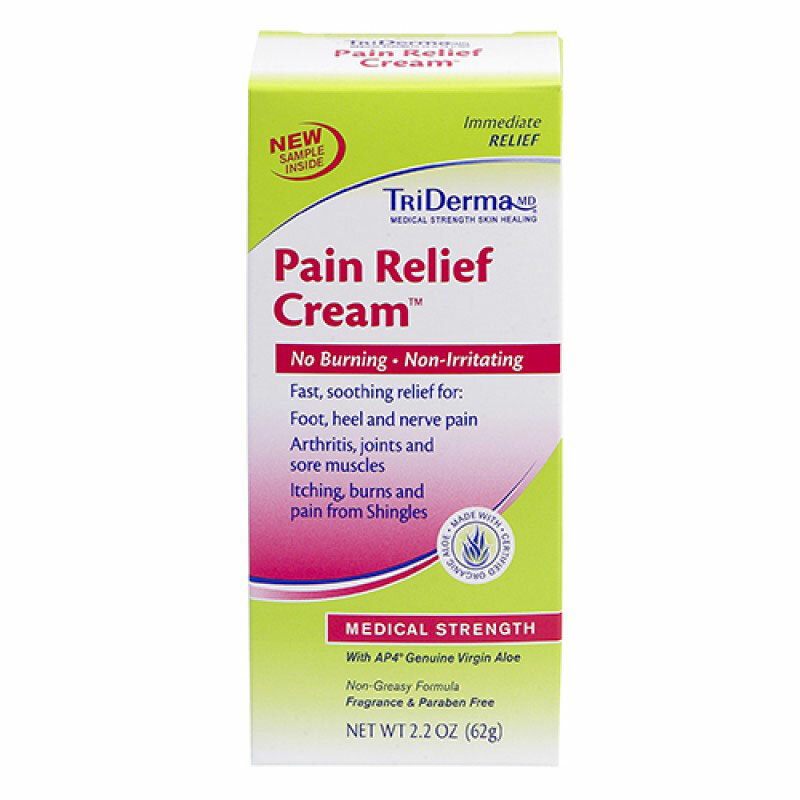 The Genuine Virgin Aloe TriDerma Relief Cream Fragrance Free 2.2oz is a specialized cream that combines two clinically proven pain relievers to provide fast relief for all types of aches and pains. It's ideal for foot, heel and nerve pain, minor skin irritations, cuts, scrapes, arthritis, simple backaches, sore muscles, joints and sprains. It helps relieve itching, burns and pain from Shingles. This unique concentrated cream provides long lasting comfort and fast relief and pain without burning or irritating skin. Each botanical ingredient was chosen for its natural pain relieving and anti-inflammatory properties which are recognized by the Homeopathic Pharmacopoeia of the United States. It combines the best of nature, science and clinically proven pain relievers to help relieve pain so you can get on with your day. Also ideal for after waxing sensitive areas for both men and women. St. Johns Wort, Arnica and Boswellia are active botanicals. Contains a touch of Menthol for extra pian relief. The light scent disappears quickly leaving no odor or fragrance. Non-greasy, Cortisone and Paraben Free. Allantoin, Aloe Barbadensis (AP4 Genuine Virgin Organic Aloe Vera) Leaf Extract, Boswellia Serrata Gum, Butyrospermum Parkii (Shea Butter), Calophyllum Tacamahaca Fruit (Tamanu Nut) Oil, Carbomer, Cetearyl Alcohol, Chamomilla Recutita Matricaria (Chamomile) Extract, Glycerin, Glyceryl Stearate, Hypericum Perforatum (St. John's Wort), Isopropyl Palmitate, Persea Gratissima (Avacado) Oil, Phenoxyethanol, Polysorbate 60, Sodium Polyacrylate, Squalane, Stearyl Alcohol, Trideceth 6.